From Goodreads: Julia’s sworn enemies are safely sequestered in a prison of the fey and her forever mate has been chosen. Not by blood, but by a circumstance shaped from coincidence. However, it’s not enough to save Julia and the others who came from Alaska their fate by the hand of the Alaska den, whose reacquisition has come alarmingly full-circle to capture them. Tharell of the fey aligns with the Singers, Were and remaining vampire to take back the one Queen who could stop the interspecies wars and establish a truce of genetics that would free all the groups from extinction and conflict. Can they rescue Julia and her allies before it’s too late? Will the Red Were’s lineage prove to be the catalyst of victory against a corrupt pack that’s grown too debauched by greed and power to be overcome? An even darker, bloodier tale that its predecessors, book four in Blodgett’s Blood Series, Blood Reign, packs a powerful punch as it unfolds. Captive in the clutches of the Reds, a controlling Were group set on world dominance, The Rare One, Julia, and her band of friends, both Singers and Weres alike, must outthink and overcome their captors in a game of cat and mouse as the Reds’ plans of genocide begin to take hold. As the story jumps back and forth between the characters simultaneous adventures, readers become enamored with the story. Blodgett is a master at setting up mini cliffhangers within her writing, and these are perfectly executed as she jumps from character to character as they unwittingly make their way towards one another, all leading up to the final battle that will have heads rolling (literally) with the final climax. Expertly crafter, Blodgett has created intense, well-rounded characters, including those we hate. From their sarcasm, humor, anger, and fear, the emotions of these characters are palpable; spanning from Julia’s good-heartedness to the evil Tony’s misogynistic ways, Blodgett leaves readers feeling like the character could indeed step right off the page, which is both thrilling and terrifying at the same time. Reader beware, Tony is indeed an awful, awful character, and you will hate him to his core… but he will finally get his comeuppance—and it is indeed satisfying. In the third installment of the blood series, Blodgett wowed me with her inclusion of the Fey. 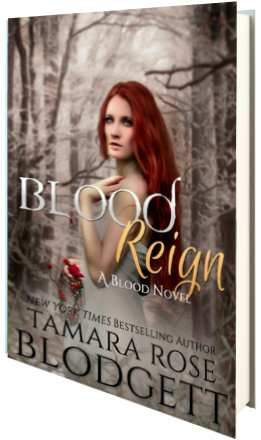 Not to be outdone, she does it again in Blood Reign, this time including new revelations and a mythical group that I didn’t think would make it into her books at all! At this point, Blodgett has brought together almost all the popular mythical beings out there, and I love how she seamlessly weaves them into her tale, aiding and abetting the characters as the series unfolds. I can’t wait to see what happens next in the series, and if you haven’t started it yet, I highly suggest you pick up book one, because this series is to die for. Five stars.